Contagious yawning may show the closeness of your relationships rather than your tiredness, say scientists. The act of yawning gets more blood flowing around the brain. The fact that it is contagious has never been fully explained, but one theory suggests it is linked to empathy between people. An Italian study in the journal PLoS One found people were more likely to yawn in response to a close relative rather than just a friend. 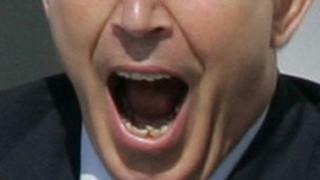 The finding suggests contagious yawning may have evolved as a way of maintaining alertness within a group. Some believe even animals such as dogs and chimpanzees have been found to be prone to it, and about half of all humans are thought to have this response. The supposed link between empathy and contagious yawning was strengthened by earlier studies in which children with autism, who tend to be less capable of empathy than other children, were found to be less likely to do it. The University of Pisa researchers observed 109 men and women from a variety of nationalities in their day-to-day activities, and recorded instances of contagious yawning. They found it was most likely between directly-related family members, slightly less likely between friends, and then less likely still between acquaintances and strangers. The delay between yawn and response was greater between acquaintances and strangers, again suggesting that empathy and social familiarity played a role. The researchers wrote: "Our results demonstrate that yawn contagion is primarily driven by the emotional closeness between individuals and not by other variables, such as gender and nationality." Dr Catriona Morrison, an experimental psychologist from the University of Leeds, said that this primitive subconscious response could shed light on the evolution of the human brain. She said: "Some have suggested that it developed from the days of cavemen when someone had to be on watch all the time - yawning increases cerebral blood flow so can improve alertness. "Social behaviour is thought to be a conscious function of the brain, but this is unavailable to consciousness. "We just don't have any control over it at all." Dr Atsushi Senju, from Birkbeck College in London, said that a similar effect had been noted in a type of baboon, with contagious yawning more likely between close allies in a troupe. However, he said: "It is still not certain that empathy is the cause - there are still those who believe that this is simply a natural reflex."